And along with these ingredients do not forget to control the amount of fat used and toss in loads of veggies for that much needed fiber which aids in weight loss. If you want to make your khichdi more exciting then try your hands on Gehun ki Bikaneri Khichdi which is a lip smacking khichdi sure to excite your taste buds. Get more innovative in cooking by adding a variety of colourful vegetables in your khichdi just like our Barley Khichdi, adding barley and fibre rich vegetables adds on to the bulk and decreases the calorie value which is good for weight loss. Bajra Whole Moong and Green Pea Khichdi is one such recipe which is protein packed due to the combination of cereals and lentils. It is also a good source of fibre, folic acid, thiamine and phosphorus. When beans and lentils are sprouted there is an increase in its digestibility and the nutrient content is also enhanced, thus making it a must have in your daily diet. Sprouts Pulao can be had safely by persons who suffer from flatulence, the only thing that needs to be kept in mind is that the sprouting is done properly and you are good to go. Soya Mutter Pulao is made with nutritious soya nuggets and green peas which power pack it with proteins. Moreover, it is really good in fibre which comes from brown rice and green peas. Try this Green Peas and Mint Pulao, a recipe with minimal spices and low in cholesterol. The green colour will soothe your eyes while minty taste gives pleasure to your taste buds. Vegetable Biryani is prepared using only 1 teaspoonful of oil and plenty of vegetables which makes it low in calorie, low in cholesterol and good for the heart. Paneer Mutter Biryani is loaded with calcium and good quality proteindue to the presence of paneer and green peas in it. Combining lentils or beans with cereals increases the protein quality of the recipe and you can thus make high quality protein recipe like Masoor Biryani which may be low fat but is quite appetizing. Try our rice recipes like Moong Sprouts Tomato and Spinach Rice, Fenugreek and Mushroom Brown Rice and Mexican Rice. Remember to enjoy them in small portions occasionally preferably for lunch than dinner. 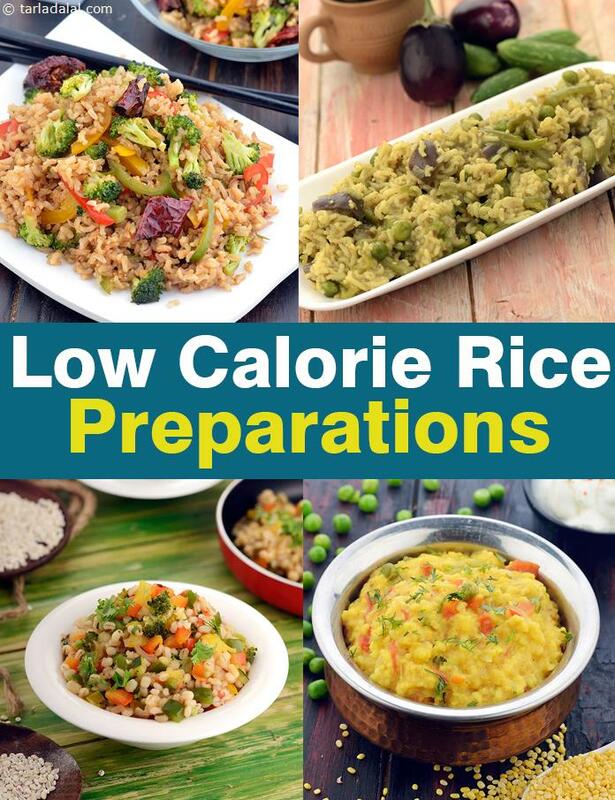 Enjoy our low calorie indian rice recipes and other low calorie recipe articles given below.